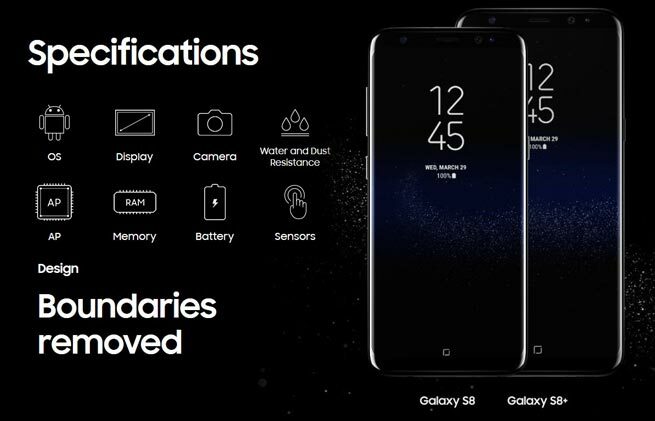 The Samsung Galaxy S8 has finally been launched at Unpacked events in New York City at March 29, 2017. The phones both have edged displays with rounded corners and faster, improved processors. We provide you Samsung Galaxy S8 specifications below. Samsung Galaxy S8 sports a large 5.8-inch QHD Super AMOLED display, while the Galaxy S8+ will feature by a 6.2-inch. The Galaxy S8 features a nearly bezel-less design with no physical buttons on the front, a fingerprint sensor and OIS camera on the back, and an octa-core 10nm SoC in the middle. Samsung Galaxy S8 powered by Qualcomm’s 10nm Snapdragon 835 chipset and 4GB of RAM. It also stocks a 12-megapixel rear-facing and 8-megapixel front-facing camera with newly added image stabilization, both with a f/1.7 aperture. The Samsung Galaxy S8 and S8+ will be available starting April 21st in colours 5 color option including Midnight Black, Orchid Gray, Arctic Silver, Coral Blue and Maple Gold.